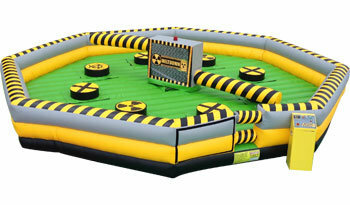 The "Toxic Meltdown"; one of the most popular event attractions, is now available for rent on Long Island! Party Rentals R Us has added this awesome unit to our inventory so call today for details. This unit can run up to 8 players at a time making it ideal for large events, school and church carnivals, company picnics and more. Not one, but two spinning boom arms try to knock you off your podium. You have to duck underneath or jump over the foam boom. Who will be the last one standing? 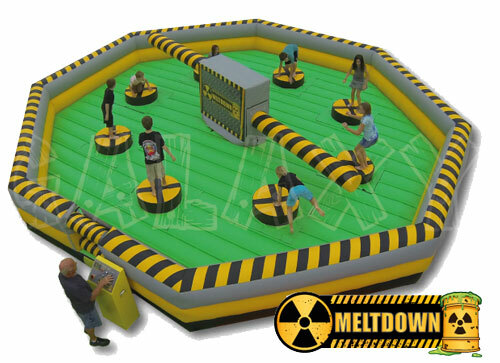 With the rental of the Toxic Meltdown game we will provide an attendant who will be in control: there is a variable speed control on the console that increases or decreases the speed of the automatic program, making it as easy or difficult as you wish! Toxic Meltdown is a fun game for the whole family.